Here’s the list of November, 2018 holidays, observances, food themes, awareness days, famous birthdays, science and history based anniversaries, and more! There’s much to learn about, celebrate, and eat all November long! Resources for teaching through November, including a PDF of November’s Special Days, can be found at the end of this list. Currently, I’m updating the November Resource List for 2018. This entry was posted in American History, birthday, Calendar, History, lesson plans, My Family, Our Homeschool, Resources, Science, Special Days, teacher resourses and tagged American History, birthday, family, history, homeschool, lesson plans, November Birthdays, November Events, November Food Themes, November Holidays, November lesson ideas, November Observances, November Special Days, November themes, science, special days, teacher resources on October 26, 2018 by Betty Jo. 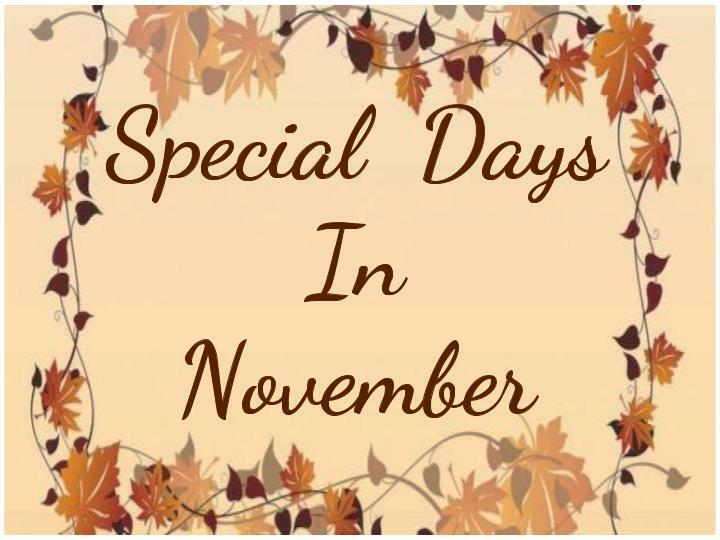 Click here for the updated for November, 2018 Special Days List! This entry was posted in American History, Art, Calendar, Geography, History, homeschool, lesson plans, Literature, My Family, Our Homeschool, Resources, Science, Special Days, teacher resourses and tagged American History, art, birthday, family, history, homeschool, November Birthdays, November Events, November Food Themes, November Holidays, November lesson ideas, November Observances, November Special Days, November themes, plans, science, special days, Special Days in November, teaching resources on October 27, 2017 by Betty Jo. There are wonderful opportunities for learning from the November calendar! Here’s a BiG resource list for teaching and learning with November’s themes, holidays, and special days. Be sure to check back occasionally throughout the month, for I’ll be adding to this collection as more resources become available. This entry was posted in American History, Art, birthday, Calendar, Geography, History, homeschool, lesson plans, Literature, music, My Family, Our Homeschool, Resources, Science, Special Days, teacher resourses and tagged birthday, educational links, history, homeschool, November Birthdays, November Events, November Holidays, November lesson ideas, science, special days, teaching resources on November 1, 2016 by Betty Jo. This entry was posted in American History, Art, birthday, Calendar, History, homeschool, My Family, Our Homeschool, Science, Special Days, teacher resourses and tagged American History, art, birthday, history, homeschool, November Birthdays, November Events, November Food Themes, November Holidays, November lesson ideas, November Observances, November Special Days, November themes, science, special days, teaching resources on October 25, 2016 by Betty Jo. This entry was posted in Art, History, homeschool, Science, Special Days, teacher resourses and tagged art, birthday, history, homeschool, November Birthdays, November Events, November Food Themes, November Holidays, November lesson ideas, November Observances, November Special Days 2015, November themes, science, special days, teaching resources on October 28, 2015 by Betty Jo.